Notification with the passing of military veteran, Eastern Airlines pilot, international pilot, and retired Delta Air Lines Flight Instructor Captain William Emil Vaden, age 81. Captain William Emil Vaden, 81 passed away at his home with his wife and his daughter by his side on January 9, 2018. Born on December 23, 1936 in Carthage, Tennessee, he was the first born child of Charlie and Mable Vaden. After graduating from Litton High in Nashville, he attended Tennessee Tech and then enlisted in the Air Force during the Vietnam War. 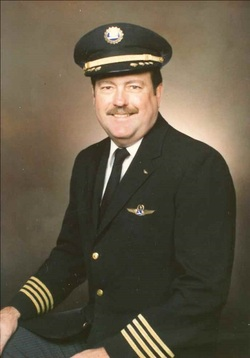 Upon finishing his tour of duty, he flew international flights for Eastern Airlines for 35 years and then flew for airlines in Austria and the Netherlands briefly before returning to his home in Stone Mountain, Georgia. After 15 years with Delta Airlines, as a flight instructor, he took a medical retirement making 50 years in commercial aviation. He had a quiet personality that could sneak up and play a trick on you without notice. He and his close friends from high school were often “cohorts” in crime. They remained close friends and gave him an 80th birthday party in Nashville on December 23, 2016. William is survived by his wife, Judith Cleveland-Vaden, his sons Charles and Kristian Vaden, daughter Vikki Vaden of Atlanta, GA., sisters Beverly Blancto (Dan) of Canton and Anne Russell (Joe) of Nashville, TN., brother Kenneth Lowry (Diane) of MS., a brother-in-law Charlie King (Connie) and special nephew, fellow pilot Greg King (Scarlett) all of Peachtree City, GA., nieces Canyn Russell, Dara Russell, Rebecca Howard (John) of Nashville, TN. and Rena Kazy (Bill) of North GA. The family will receive friends on Saturday, February 10, 2018 from 11am to 12pm at the Johns Creek Baptist Church, 6910 McGinnis Ferry Road, Alpharetta, GA 30005 where a Celebration of Life Memorial Service will follow at 12 Noon in the church sanctuary with the Rev. D.J. Johnson officiating.